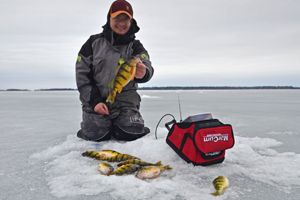 I could hardly wait to get home from the Northwest Sportshow and find out if the entire hubbub about great perch fishing was true. With the help of a new friend, I’m happy to say that it is, at least it was on Leech Lake yesterday; here’s how it started. When somebody tells you something like that, it’s only natural to drop a few hints that might encourage an invitation to tag along. So that’s what I did, I dropped a hint; I said “Can I come along?” Happily Josh said yes and I’m glad he did because not only did we have blast fishing together, it gave me time to get acquainted with a great guy. One who I think you might want to get to know too, but I’ll come back to that. We’d carved out some time to fish in the afternoon, so I met up with Josh around 1:30 PM at Trapper’s Landing Resort, where he’s the co-manager. A 15 minute drive around the lake would lead us to a spot where we could park the truck and walk out to one of Josh’s fishing spots. Along the way, I could see his “guide brain” working as he sized up his options. Torn between fishing his own favorite spots or following up on the lead from his friend, he settled on following the hot tip. Ice conditions were ideal for walking, 95% of the lake’s snow cover had already melted and drained off the ice. The surface was soggy, but there was very little standing water and there was a quarter inch of slushy, snow-cone ice on top. That made walking easy, in fact it was one of the easiest walks I’ve had in recent years. Josh had commented during our drive that he couldn’t believe nobody was driving pickups on the ice. But when we started drilling holes, we found out why. While there’s still 2 feet of ice covering the lake, the good stuff is separated from a 6 inch top layer by a couple inches of water. I’ve driven in these conditions before and it’s no fun, the truck rides on top, over the good patches, but occasionally breaks through the top layer. When that happens, you’re stuck and there’s no way out except winching your way out, fot-by-foot until you get back to a hard spot. There were some anglers using ATV’s to travel; apparently they were okay because we watched them travel without getting stranded. But without having firsthand experiences, I’m not ready to endorse ATV travel; you’ll have to make that judgement for yourself. Once we were set up, small perch threatened to drive us crazy. They struck as fast as we could get our lures in the water, but the jumbos Josh was looking for had disappeared, they were nowhere to be found. It could have been because the weather had changed, or maybe because the flowing water forced a change of location, who knows? We looked at the chart, chatted a little bit and decided to go for a walk. The area we were fishing was a large, shallow flat that lays adjacent to a deep hole. There was no reason to believe that the fish that were there last weekend would have any reason to move very far. We reasoned that crossing over the top of the flat and finding the edge of deep water on the opposite side might help us track them down. We walked about a block, drilled a new set of holes and this time hit pay dirt. Located in 6 to 7 feet of water, perch of all shapes and sizes showed up immediately. We continued catching a fair number of small fish, but this time there were some jumbos mixed in too. Because we were enjoying the action, I didn’t take time for precise measurements. But I’d estimate that we had a half dozen fish in the 11 to 12 inch range and another 15 or so that were between 9-1/2 and 10-1/2 inches. Josh was using a tungsten jig tipped with an artificial tail and the fish seemed to like that. I used a red/silver Perch Talker to begin with and it caught a lot of fish. Later I switched to a ¼ ounce Blue Scale Glow Spoon hoping to encourage strikes from larger fish. That was a good move because for me, the larger fish definitely responded better to the larger size bait. I’ve always believed that Blue is a good color on Leech Lake, Josh agreed, along with his other favorite, perch pattern lures, Blue is one of his preferred colors too. Earlier I said I’d work back around to why I think you should get to know Josh. I'm endorsing him because guys like this don’t come along every day. Growing up in Dassel, MN, (just down the road from my dad’s cabin on Big Swan Lake), Josh learned to hunt and fish at an early age. By the time he was ready for college, he was already experienced enough to land summer jobs working for resorts and outfitters in the Ely area. In fact he worked his way through 4 years of college as a fishing and canoe guide in the boundary waters, working on some of the lakes that I’m still dreaming about visiting some day. By the time he wrapped up college, Josh moved south and gained more experience working in the fishing resort industry for the McQuoid family. He began working for Kevin at Mac’s Twin Bay resort and later for Terry at McQuoid’s Inn where he was able to get work year around. “At one point I was spending 200 days on the lake every season. 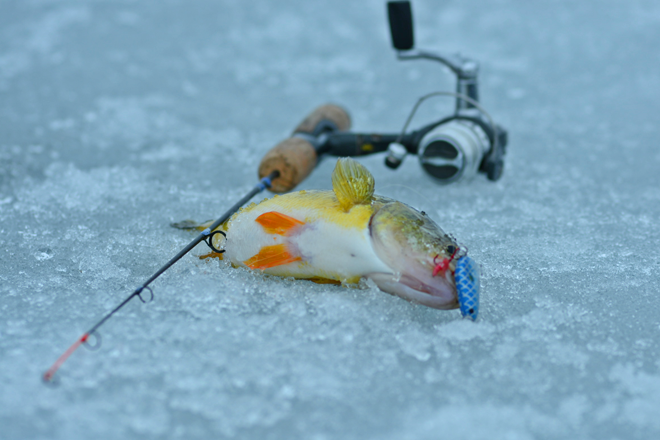 I was guiding on the ice and during the open water season and at the same time, learned a lot about how resorts are operated;" Bullivant said. About 6 years ago, Bullivant landed a new job as the general manager at Trapper’s Landing Lodge near Walker, MN. Not long ago, Trapper’s Landing was acquired by Reed’s Sporting Goods. If you were to check out their website, you’d see that Trapper’s Landing is billed as a “Luxury Resort”. If you ask me, I’d describe it more as “Luxury on Steroids.” This is the only place I know of where you could literally book a cabin, show up at the lake without any fishing gear at all and still expect to have a great fishing trip. Like I said, I think that you might want to get to know this guy. At 36, he’s already got more experience in the resort and fishing industry than most people gain in a lifetime. He’s energetic, sincere and loves to fish; that was more than obvious during the few hours I was lucky enough to spend on the ice with him. OH and by the way, they are open year around. 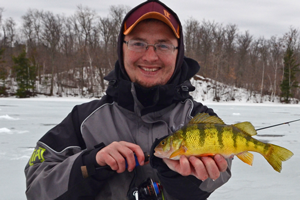 So if you wanted to get in on some perch action this weekend, they could probably help you out. For more information, follow this link to >> Contact Josh at Trapper's Landing Lodge. Jeff Sundin is a full time fishing guide, outdoor writer and photographer. Learn about guided fishing trips and more, click >> More About Jeff Sundin.